Save 5% off your entire order with this coupon code from Bed In A Box. 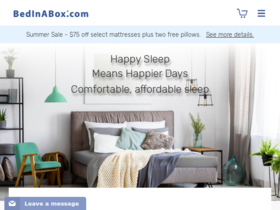 Use this coupon code to get $75 off Azul, Adagio, Silk Symphony, Serenity, Tranquillium mattresses + 2 FREE pillows from BedInABox.com. Shop sale at Bed In A Box for up to 50% off bedding and accessories. Enjoy free shipping on all orders everyday from Bed In a Box. Check out Bed In a Box online for their latest special offers.